Idiopathic toe walking is a condition where a person, generally a child, walks on their toes in the absence of any disease state. Most young children begin walking around 12 months of age and it is not uncommon for many of them to walk on their toes during their initial period of learning to walk as they develop their gait pattern. If this pattern of walking persists beyond two years of age, it should be a cause for concern for parents and the condition needs to be investigated. Conditions such cerebral palsy or autism may be first diagnosed in children who walk on their toes. In very general terms walking on the toes on both feet is seen in kids with muscular dystrophy while toe walking on only one foot in most instances is from trauma to the foot, ankle or leg. If all possible neurological disease states are eliminated and there is no history of trauma to the foot or leg, then a diagnosis of idiopathic toe walking is made. However, recently the thought process has become one where even in these cases, there may be a neurological component. Preliminary studies have shown a correlation between sensitivity to vibration and hypersensitivity in the feet as a reason for children to toe walk. This is an area that needs further investigation. After ruling out a neurological basis for this condition, idiopathic toe walking can be treated by a number of means and in combination. Stretching exercises- children who walk on their toes show a tendency to exhibit a tight gastrocnemius and soleus muscles which are the two muscles below the back of the knee that come together and form the Achilles tendon. The younger the child, the more effective stretching exercises become. 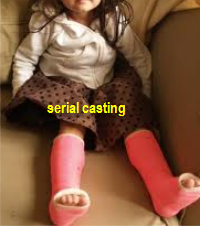 Serial casting- is another avenue used to decrease the tightness of the Achilles tendon and associated muscles. A non-removable cast is applied to the foot to just below the knee. Each cast is left on for a period of time, determined by the physician. As a new cast is applied, the foot/feet is further dorsiflexed (bent upwards) in an effort to stretch the Achilles tendon and muscle group. This has to be done in stages as it would be very painful to the child and probably impossible to stretch the muscle group by trying to accomplish all the stretching necessary in the initial casting. Ankle-foot orthoses- In situations where the plantarflexion (bending down of foot) also known as equinus is not so severe, the doctor may decide to try what is known as an ankle foot orthosis (AFO) . This is a device that attempts to maintain the proper angle of the foot to the leg while allowing the child to walk. Stated the other way, it does not allow the child's foot to plantarflex and thus alleviates toe walking. Night splint- In conjunction with an ankle foot orthosis, the child may also wear a night splint. This is a removable cast like device that is worn while the child sleeps and just like all the other treatment options attempts to stretch the achilles tendon. Surgery- In more severe cases surgical lengthening of the Achilles tendon is employed. 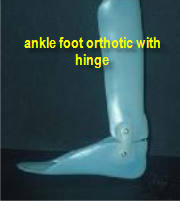 If the posterior leg muscle group is too tight and has not responded to the previous mentioned conservative options, then actually lengthening the tight heel cord may be the only means to allow the child to walk normally. Botox- In recent years Botox injections have been employed with a mixed degree of success. Botox or botulinum toxin injections have the ability to relax muscle, so in theory if a child has a tight heel cord, injecting the muscle with Botox should loosen up the muscle. The injection in conjunction with night splints and stretching has had some degree of success. It is worth noting that even with what may be considered a "successful" treatment, most children will require some kind of orthotic device going forward. In many instances, improvement seen with treatment degrades over time. Continued walking on the toes into adulthood can impact the quality of life as it is an altered gait and opens the adult for a myriad of problems.